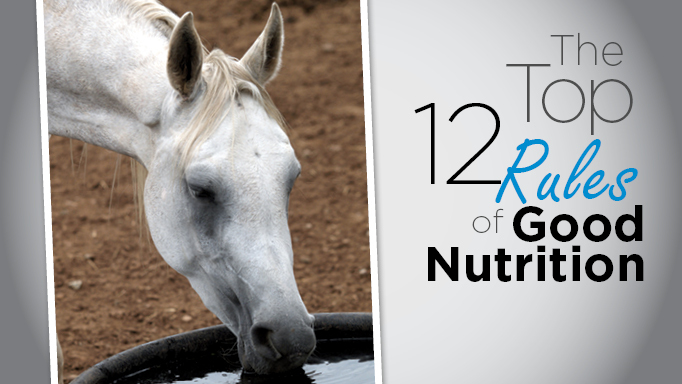 Feeding horses isn’t complicated if you just remember these important guidelines. 1. WATER, water, water. Horses should always have access to fresh, clean water…even if they are hot. It is a myth that giving water to a hot horse is harmful. The microbial organisms in the horse’s hindgut ferment fibre, found in the cell wall of plants. Without enough fibre for these microbes to ferment, their ecosystem can be negatively affected, potentially resulting in colic. Long stem forage helps move food through the digestive tract normally. Horses have evolved as grazers; their digestive tract is perfectly suited to it, and they spend most of their day grazing when they can. If a horse doesn’t have sufficient forage to graze, he will spend his time developing other behaviours, such a weaving or cribbing. • Good quality forage provides all of the calorie and protein requirements of most horses, as well as significant amounts of calcium, phosphorus, potassium, iron, magnesium and other minerals. It can also be an excellent source of the B vitamins, vitamin A, D and E. Ideally, horses should have forage in front of them at all times. 3. Cereal grains and commercial mixes are fed for energy. Cereal grains such as oats, barley and corn, included in most commercial feeds are considered “concentrates” as in “concentrated energy sources.” These feeds are designed to provide calories, and will also be balanced with protein, vitamins and minerals suited for the intended horse. However, if your horse only needs a top up of protein, and some additional vitamins and minerals to balance out what might be lacking in the hay, you might need a “balancer,” which is a more concentrated feed supplement rather than an energy-filled grain mix. This is particularly true if your horse is only in light or little to no work, and may be prone to weight gain and obesity. When you are feeding horses grain for energy, be sure to offer as many small meals per day as possible to decrease the volume of each meal. 4. 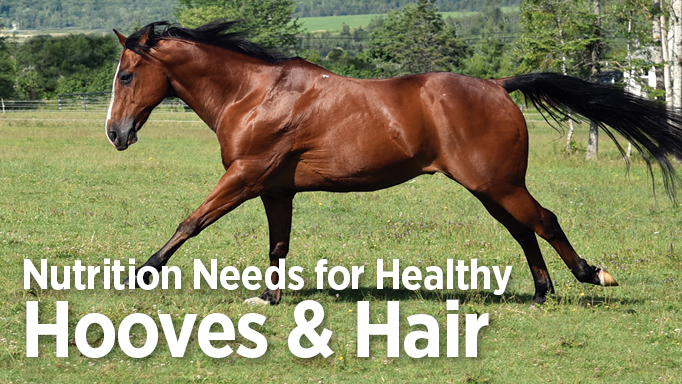 Learn how to assess your horse’s body condition. Body condition scoring is the simplest tool you can learn to help you quantify the fat coverage on your horse. Body condition scoring typically uses the 1-9 Henneke Scale, where a horse that is a 1 is an emaciated (scary thin) horse, while a horse that is scored a 9 is grossly obese (bulging fat). Ideally, most horses are around a score of 5, where you can’t see the ribs, but you can easily feel them. I also am okay with horses that are a little thinner at about a 4.5, where you can see a faint outline of their ribs. Recognizing the difference between a 5 and a 7 or a 3 can have a significant impact on your horse’s health, as a horse that is too overweight (>6) can have increased health risks such as metabolic syndrome, laminitis and heat intolerance, while a horse that is too thin (<3) will have little fuel reserves for any work, may have lower fertility and is often difficult to rehabilitate. Also, recognizing subtle changes in your horse’s fat coverage can indicate that his calorie intake needs to be adjusted, or may be a sign of something else happening (for example dental issues, cancer, overwork, etc.). 5. Use a weight tape. Weight tapes can give you an estimate of your horse’s body weight, which can be a guide for feeding – as most horses should consume AT LEAST 1% of their body weight in hay or dried forage, or for determining deworming medication doses. It can also provide more quantitative information about your horse’s girth circumference and potential changes as a result of feeding. 6. Choose supplements wisely. There are literally thousands of different supplements available for horses. Some are fed to provide a specific nutrient with a proven benefit (eg. biotin in hoof supplements), while other supplements may or may not have proven research behind them. Some might even contain elements that might cause a positive drug test on your horse, or contribute to toxicity – such as iron supplements or some kelp products that can contain very high levels of iodine – so be careful. It is wise to discuss with your vet or equine nutritionist what nutritional (eg. electrolyte or omega-3) or non-nutritional (eg. joint or herb) supplements your horse might need, as well as to help select a particular brand that has published research regarding its efficacy. 7. Don’t over-supplement. The most basic diet for horses contains water, forage and salt (because sodium, is lacking in most forages). Most other required vitamins and minerals are found in good quality forages, or are found in any concentrates or balancers you may also feed. If you add another vitamin-mineral supplement to your horse’s diet, you run the risk of doubling up his intake of a particular nutrient. If you then add another more focused supplement, you might be adding a third dose of a nutrient, and so forth. For example, the only scientifically proven nutrient for hoof health is biotin, and yet most hoof supplements also contain additional zinc, copper, etc. Most “calming” supplements contain high levels of magnesium, even though magnesium requirements are often easily met with the forage in the horse’s diet. It is easy (and wise!) to add up all of the minerals in all of your different supplements and make sure you aren’t getting too high. 8. Get your hay or pasture analyzed. When doing a nutritional evaluation for a horse, the most important tool is a hay or pasture analysis. This relatively cheap ($20 to $80) test lets you know exactly how much protein, or calcium or magnesium (or specific amino acids or vitamins, if you want to pay more) is in the main component of your horse’s diet. 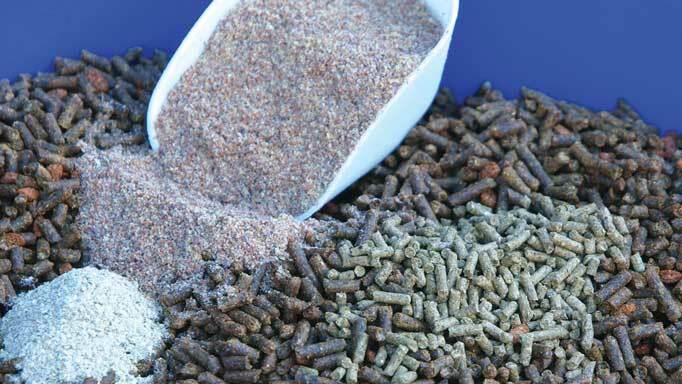 Without that information, you horse’s diet will never be able to be fully balanced, and you will likely be overfeeding your horse several nutrients, and potentially costing you more money. For farms where new hay is purchased monthly, this might not be feasible, but your hay dealer should be able to provide some information. 9. Feed by weight not by volume. The Nutrient Requirements of Horses uses values such as grams of protein per day, or milligrams of iron or copper. Percentages on a feed tag don’t tell you anything, unless you know how much – by weight – you are feeding of that product. For example, a feed with 12% protein and 0.9% calcium, could provide 240 grams of protein and 18 grams of calcium if you’re feeding 2kg of it, but we would have no idea how much protein is obtained in a “scoop” of feed, particularly when scoops could be quarts, litres, cups, big coffee cans or small coffee cans. Hay is similar; we all know that within a bale of hay we might have big flakes or small flakes – and we often eyeball it to determine how much to give. But one flake of hay could weigh 1kg, or even 3kg – depending on the size, or even type of hay (alfalfa tends to be baled more tightly and is usually heavier per flake). Get into the habit of weighing out how much you feed, at least so you know how much one of your scoops or average flakes weighs. 10. Optimize pasture usage. 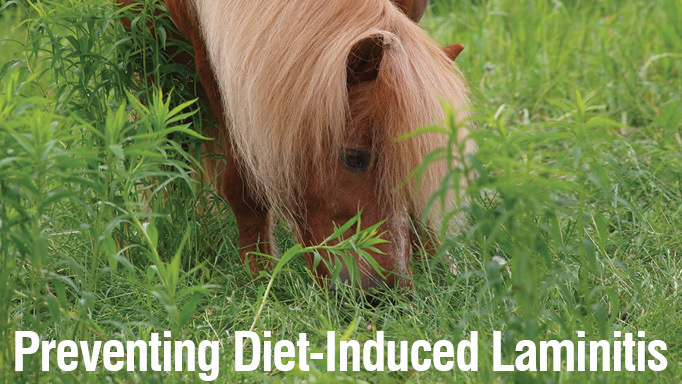 Pasture is a low-cost, natural, nutrient-dense feed for horses. When managed effectively by supplementing the soil as needed, using rotational grazing practices, and not over-stocking, your horses can be managed with very little hay for a good portion of the year. 11. Change feeds slowly. 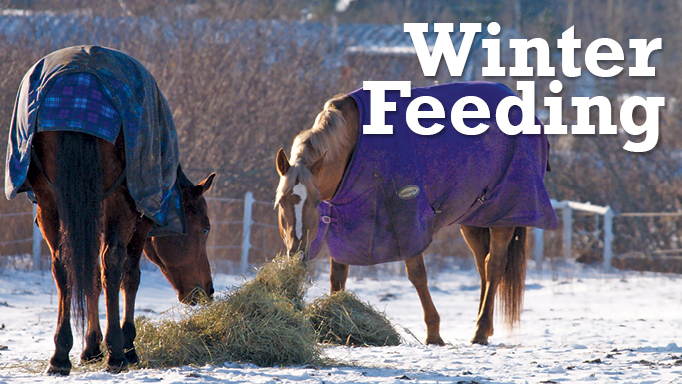 For any reason you have a new type of feed for your horse – whether it be a new type of grain, new batch of hay, or introduction of pasture in the spring – adapt your horse to the new diet over several weeks. A rule of thumb is to change 20% of the ration every three to four days. This gives the horse time to adjust to new feeding habits, and gives the microbial ecosystem in the horse’s digestive tract time to adapt. 12. Know where to get valid nutritional information. Almost every survey of horse owners that asks where they get nutritional information for their horses reports that they get it from their veterinarian. The sad truth, however, is that most veterinarians receive very little nutrition training – just like your general practitioner isn’t also your dietician. Depending on what information you need, contact your feed company or an independent nutritionist for help. Remember, your horse is an individual, and what works for someone else’s horse, might not work for your horse, so asking around online isn’t ideal. Scientific research papers, extension articles, magazine articles written by educated professionals, and textbooks are good sources of information. Dr. Shannon E. Pratt Phillips is an award-winning associate professor of Equine Nutrition in the Department of Animal Science at North Carolina State University. She grew up in Toronto, ON, where she began riding at age nine. She recently stepped back into the hunter ring after nearly 20 years, and competes on her local show circuit. Supplements for healthy hooves and coats.